1 Cook pasta according to package directions; drain and set aside to cool. 2 Heat oil in large nonstick skillet over medium-high heat. 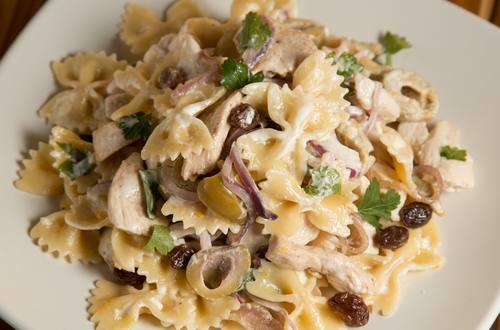 Add chicken, onion, olives, and raisins and cook, stirring often, until chicken is cooked through and onions are tender. Set aside to cool. 3 Meanwhile, combine Hellmann's® or Best Foods® Mayonnaise Dressing with Olive Oil and orange juice in large bowl. Add cooled pasta and chicken mixture to bowl and toss to coat.